believe in the wonder of the stars and the moon. they dance on the flowers and sing the songs of love. 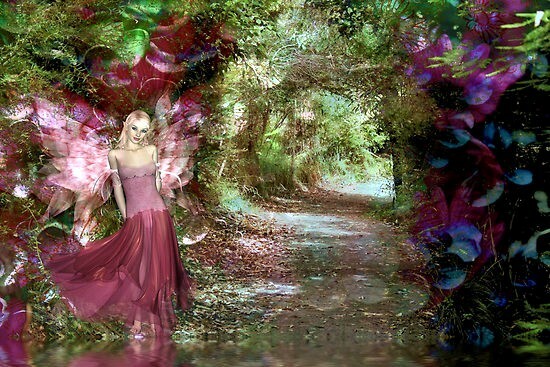 the fairies will be there to watch over you!" To those who practice animistic religions each plant, each animal and even each rock has a spirit and these spirits, joining together as a body of water or a tract of land, become the elemental energies of the ecology. Nature Spirits are incorporeal beings from non-material dimensions that employ these elemental energies of the Earth in order to bring themselves into manifestation in the material world. Mother Earth abounds with these beings, each type having its own special function to perform, and the Nature Spirits are involved in every aspect of life. Throughout the world there are folktales and fairytales regarding these creatures and the divine forests and sacred waters that they protect and sanctify and their interactions with the humans who enter into these realms. Different people have different names for the Nature Spirits such as the Irish Sidhe and the German Kobold and some of the English language names you may be familiar with include: boggarts, brownies, elves, goblins, fairies, fauns, gnomes, leprechauns, nymphs, pixies and trolls amongst many others. * Nature Spirits are also called Devas or Shining Ones because of the light they radiate when they manifest into our world. Sometimes in these folktales the Nature Spirits appear in the stories as a sort of Spirit Guide, helping the hero who enters their realm upon some sacred quest. Where they differ from Spirit Guides is that their main concern is not for the seeker on his journey, but for preserving the spiritual essence of area through which he travels and the Nature Spirit may try to obstruct the hero in his quest if he is seen as a threat to the sanctity of the area. From a scientific viewpoint these spirits seem to behave in a similar manner to they way we understand atomic particles to behave, moving backwards and forwards in time and space, fluctuating between energy and matter. The theories of quantum physics suggest the possibility of alternative universes and multiple dimensions from which these spirits could be originating and these spirits may embody a “quantum mind” wherein what we would describe as forms of energy may have a conscious awareness and be able to interact with those of different dimensions or even different universes. 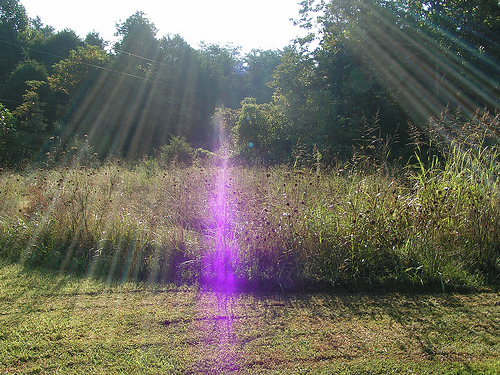 These spirits cannot be directly observed anymore than atomic particles can be observed, but can only be discerned by the energy footprints they leave, like the glow of fairies in the garden. nor are all fairies nature-spirits. The same applies to the relationship of nature-spirits and the dead. seem to take on the character of nature-spirits." All things in the material world are made up the four elements, Earth, Air, Fire and Water and contain the nature spirits of these elements within them. These are the nature spirits that interact with the material world, but have their existence in the non-material beyond this plain of existence. When these spirit consciousnesses descend into the material world they manifest in the manner of physical existence within the boundaries of the realm into which they settle. It becomes and elemental spirit according to the element it forms in: In earth it becomes a gnome; in water it becomes an undine, in fire it becomes a salamander; in air it becomes a sylph. Each of these elementals has a distinctive and important part to play in the creation and maintenance of life within the natural world. Earth Element (Gnomes) -- Earth spirits maintain the physical earth and they give us the basic energy of life in its rawest form and they aid in maintaining the physical realm of the earth. Thus, when they meet a human, they take a human form, though short, stocky and thick-set, due to their earthy nature. They help us to become more aware, but remember that they can be tricksters as well. Water Element (Undines) -- Water spirits are found in natural sources of water such as rivers, springs, and the ocean. The water spirits govern magnetism and chemistry and they stimulate our emotions and spiritual impulses. They first appear as a blur of color, but as they manifest they take their form from our imaginations, and often appear mermaid-like.They are infinitely sensual, something to keep in mind if you encounter them. They are usually found in forest pools and waterfalls. They have beautiful voices that can be heard over the sound of water. In some legends, undines cannot get a soul unless they marry a man and bear him a child, which often leads to romantic, but tragic consequences. Air Element (Sylphs) -- Air spirits are found in any motion of air, from a light breeze to a tornado. They are composed entirely from wind and thought, and they are the source of all life energy. Sometimes they are depicted as cloud beings. Sylphs are responsible for the myths of "angels", the winged protectors of the Garden of Eden and they defend the high mountain peaks that are their home. Mercurial and intense they assist humans to develop mental abilities and inspiration. Fire Element (Salamanders) -- Fire spirits are everywhere and they will often first appear as sudden bursts of heat, but when manifest they will take the form of the lizard of the same name. They are responsible for all light, heat, and strong powerful emotions that drive “The Will”. Salamanders when called upon to assist in magick can have a very profound effect upon human nature and while helpful in stimulating energies fire spirits can be temperamental and impulsive. Every tribal people had its tales of local and guardian spirits of the tree. These spirits were guardians of the forest, often guarding a treasure or secret within the forest and each of the trees themselves had a connection to a spiritual connection of its own. Trees formed an important part of religious worship and many Sacred Groves served as religious centers throughout the world. It may be of interest to note that with the coming of the patriarchal Church religious gatherings moved from these sacred groves into grottos within the Earth and away from the spirits of the trees once so important to those early peoples reverence for Mother Earth. Within these sacred trees was thought to reside another type of Nature Spirit, spirits that were of an elemental nature of wood and theses were the Spirits of the Trees. These tree spirits were thought to be of two essences male and female. “Tree Fauns” were the male tree spirits. Tree fauns were said to be wise and kind, but reserved in their dealings with humans. They were sensitive to the emotions of women and would sometimes court their souls. “Tree Nymphs” were the female tree spirits. More playful and adventurous with humans they would often fall in love with a human man. 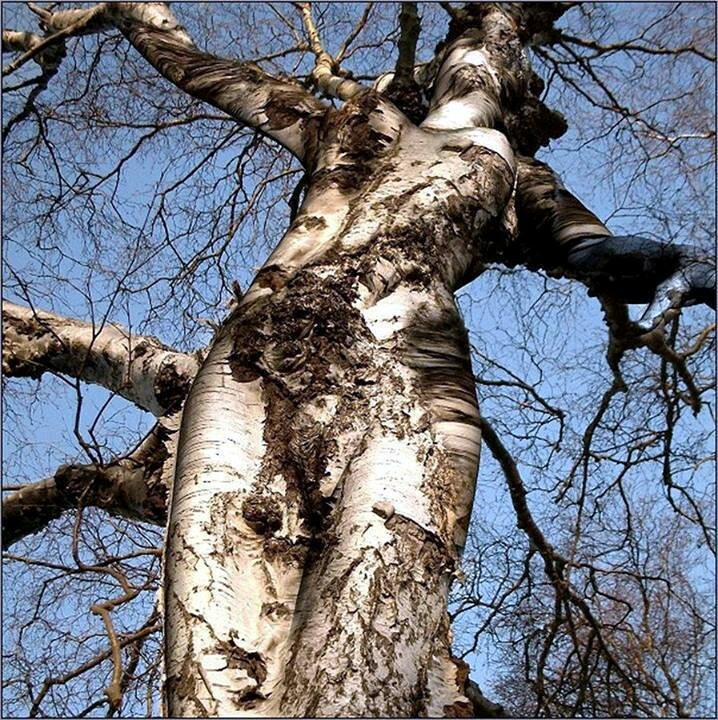 Dryads were the female tree spirits of Greek Mythology. Technically, dryads are the nymphs of oak trees, but the term is now used for all tree nymphs. Tree Spirits were long-lived, but not immortal. If the tree died, the spirit associated with it died as well. For that reason, the Greek gods punished any mortals who harmed trees without first appeasing the tree spirits. It is highly doubtful that much thought is given today to the idea of mollifying the tree spirits as the great forests of the Earth are being cleared by the machinery of man. Each tree has a spiritual essence, but there are special trees that appeal to the human condition because of the special properties they bare. For this reason there were certain trees that were seen as holding special dominion over the affairs of man and of nature and sacred groves of trees are of great religious importance to many culture and are the meeting place for activities and rituals. Within the grove all become linked and hidden knowledge is revealed. The trees below are especially symbolic and have been throughout history. Alder Tree -- Associated with water. The catkin bearing alder tree resists decay in its watery habitat and the water spirits or undines love this tree as does the unicorn. The leaves of an alder tree can be made into a tea to treat kidney problems. Apple Tree -- The custodian of wisdom and tree of the soul. Freya, the goddess of wisdom walks through heaven dispensing golden apples to the gods which will give them the gift of wisdom and understanding and the day of the apple tree is Friday (Freya’s day). To grow an apple tree in the garden is a happy omen and the Celts believe that apple trees grow in the Celtic paradise. The apple tree man dwells in the middle of the apple trees and he is the guardian of their fertility and the fairy protector of the spirit of the goddess. Ash Tree -- It is said to be an ancestor of humankind. In Greece powerful families were believed to have come from ash trees. In Norse mythology the sacred ash is believed to be the entire support structure of the universe and even today, in certain places, people will leave tokens of human hair hanging from an ash tree in hopes that their wishes, hopes and desires will be granted. Used in fashioning witch's wands for healing. Aspen Tree – The tree of heroes whose crowns of poplar leaves gave them the power not only to visit the Underworld, but also to return safely. The aspen crowns found in ancient burial mounds may have been included to allow the spirits of the deceased to return to be reborn. An aspen leaf placed under the tongue would make the bearer more eloquent, traditionally a gift of the Faerie Queen. Bay Tree -- The tree of healing. It is associated with masculine principles and medicine, music, and the rays of the sun. The bay protects dwellings and gardens. Bay leaves crowned poet, heroes and important men. Grow a bay tree near your house for it protects your dwelling and wards off illness. When a baby is born it is lucky to celebrate by planting a bay tree for the baby’s sake. Never plant a bay tree where vines grow. Birch Tree -- Associated with Lammas tide on August 1, the light of the stars, the moon and the sun. It is a symbol of summer ever returning. It is said the birch is the mother of the oak tree because in prehistoric times it was the birch that prepared the earth floor for the majestic oak to be born. It is said the fairies love this tree in the springtime. Used in fashioning witch's wands for banishing. Blackthorn Tree -- A winter tree, its fruits, called "sloes", only ripen after the first frost. The wood of the Blackthorn is traditionally used to make the Irish shillelagh. It represents the influence of fate or outside influences. Bramble Tree -- The fairies love the bramble tree because it is wild and protects the penetration of secluded sacred faerie clearings. Broom Tree -- The properties associated with the broom tree are that of astral travel and flight. The Irish called it the "Physician's power" because of its diuretic shoots. Sweep your outside ritual areas with it to purify and protect. Burning the blooms and shoots calms the wind. Be cautious if you plant Broom however, it will quickly multiply. Cedar Tree -- Also known as the Tree of Life, Arbor Vitae, Yellow Cedar. Ancient Celts on the mainland used cedar oil to preserve the heads of enemies taken in battle. To draw Earth energy and ground yourself, place the palms of your hands against the ends of the leaves. Cherry Tree -- Symbol of death, rebirth and new awakenings. Wild cherry folklore has unusual associations with the cuckoo, whereby the bird has to eat three good meals of cherries before it may stop singing. Folklore from the north east of Scotland warns against using the cherry tree's wood for any purpose, as it was considered a witch's tree. An infusion made of the stalks of the berries is used medicinally to treat bronchitis and anemia. Elder Tree -- Legends said it was unlucky to bring any part of an elder tree into the house because it would bring a death in the family. It actually has a feminine soul. It is magickal, healing and fragrant. If planting an elder tree in the garden remembers it likes to be protected and hidden. In fact all the fairy trees like to be planted at a distant from others. Fig Tree -- The fig tree appears in the story of the Garden of Eden when, after eating the forbidden fruit, Adam and Eve covered their nakedness with leaves that are usually said to be from the fig tree. The fig tree has a sacred meaning for Buddhists. According to Buddhist legend, the Buddha, achieved enlightenment while sitting under a bo tree, a kind of fig tree. The bo or bodhi tree remains a symbol of enlightenment. Fir Tree -- The Fir is a very tall slender tree that grows on the upper slopes of mountainous. Fir cones respond to rain by closing and the sun by opening. Fir can see over great distance to the far horizon beyond and below. Fir indicates high views and long sights with clear vision of what is beyond and yet to come. The Silver Fir Tree -- Brings the knowledge of present and past lives into the now. The color silver links to the "silver thread" of awareness of the spiritual journey and the gift of insight. Hawthorn Tree -- This is the most sacred tree to the fairies probably because it is so wild, uncompromising and fragrant. If you sit under the thorn tree on May Day Eve, Samhain Eve and Midsummer Eve you can commune with the fairies. Hazel Tree -- The tree of wishes and tree of the star goddess. It is associated with the Celtic goddess of the stars, Arianrhad, whose image was seen in the stars of the constellation we now know as the constellation of the Corona Borealis. The Hazel is called the tree of wishes because it has the power to grant the hearts desire. Holly Tree -- Symbol of the life force, vitality and immortality. It is considered a lucky tree to grow in the garden because it wards off negative energies. 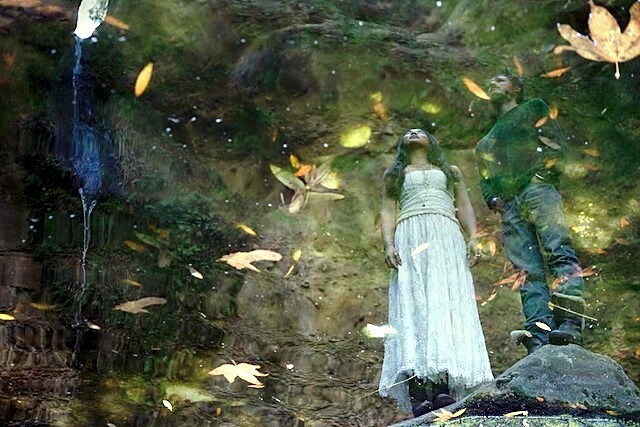 The shiny green leaves represent the vitality of life even in the coldest of times and is used in Yule for this reason. It is lucky to burn dried holly branches but not if their still green. The male holly tree (the prickly one) and the female holly tree (the smooth variegated one) are inhabited by respectfully the Holly Man and the Holly Woman, (the winter guises of the Green Man and the Green Woman.) Used in fashioning witch's wands for protection. Juniper Tree -- Considered a protective tree and unlucky to cut down a jun niper tree. The tree has an abundance of healing properties. Infusions can be made to treat kidney and liver troubles, arthritis, dropsy and help the elderly. Larch Tree -- The larch plays an important role in Siberian mythology where it takes the place of the ash as the World-tree. Their shamans use larch wood to rim their ceremonial drums. The smoke from burning larch is said to ward off evil spirits. Larch may be used for protection and to induce visions. Laurel Tree -- Sacred to Apollo. When the Greek nymph Daphne was being chased by Apollo she asked to be changed into another form and Athena transformed her into a Laurel tree. Much respected in Roman times, the Latin word “laurus” means "praise" and "renowned". A symbol of wisdom and glory, the Latin “laureate” means "crowned with laurels", i.e. "poet laureate". Lilac Tree -- It is the fragrance of the lilac tree that is considered magickal. The fragrance is believed to carry humans into fairyland and the supernal world. English tradition considers the lilac to be an unlucky flower to be brought into the house because it is associated with death, perhaps from the fear of the power of the fragrance of the lilac. It is really quite a beneficiary tree. Its flowers can be eaten and used as a tonic for the nervous system. Maple Tree -- Maple trees meanings includes balance, promise and practicality. The maple is seen as a happy tree, alluring, mystically bringing together all who gather under it's sheltering branches. Carrying a young child through the branches of a Maple tree was traditionally thought to encourage good health and long life. The Maple is also said to bring lifelong success and abundance. Mistletoe Tree -- Also known as Birdlime, All Heal and Golden Bough. It was the most sacred tree of the Druids, and ruled the Winter Solstice. The berries are poisonous! Bunches of mistletoe can be hung as an all-purpose protective herb. The berries are used in love incenses. Oak Tree -- The tree of truth. It is ancient and wise and has an old spirit. The mistletoe of the oak tree has many magickal properties. It is also a marriage tree, symbolic of the marriage between the god and the goddess. If you dance around the oak tree and wear some of its leaves you will have a long and happy marriage. It is said that if there is a question in your heart that you cannot find the answer to then go to an oak tree and embrace it and ask the spirit of the oak tree to answer your question. If you should know the answer it will be send to you in a prophetic dream. The oak is frequently associated with Gods of thunder and lightening such as Zeus and Thor. This association may be due to the oak's habit of being hit by lightening during storms. Olive Tree -- The symbol of wisdom and peace. 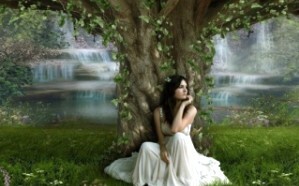 The olive tree was the sacred tree of goddess Athena and Athens, the capital of Greece, took its name from the goddess. Zeus had decreed that the city should be given to the god who offered the most useful gift to the people. Poseidon gave them the horse. Athena struck the bare soil with her spear and caused an olive tree to spring up. The people were so delighted with the olive that Zeus gave the city to Athena and named it after her. Athena is often shown with an olive branch, a symbol of peace and plenty.Ancient Greeks used olive oil to fuel their sacred lamps, while specially aged olive oil was used by the church during weddings and baptisms. Palm Tree -- Palms are the symbols of peace and opportunity. In many historical cultures, palms were also symbols for such victory and fertility. Early Christians used the palm branch to symbolize the victory of the faithful over enemies of the soul. In Judaism, the palm represents peace and plenty. Pear Tree -- The early Germanic peoples would carve runes into the wood of a pear tree. honored by the Northmen. The pear tree is also mentioned in literature and folklore connected with love and temptation. In Greek and Roman mythology pears are the sacred fruit of the goddesses. The Chinese believed it a symbol of immortality. Pine Tree -- The tree of the Sun. Its old title was "the sweetest of woods” and the scent of Pine is useful in the reduction of guilt. Like all evergreen trees which do not lose their leaves or green color during the wintertime, the pine tree stands for immortality. In Japan, the pine tree stands as a tribute to strong character and energy because it holds up against strong winds. Poplar Tree -- The poplar tree is considered the tree of old age and the autumnal equinox . Heracles wore a crown of poplar leaves when he retrieved Cerberus from Hades and the upper surface of the leaves was thus darkened from Hades' smoky fumes. In Christian lore, the quaking poplar was used to construct Christ's cross and the leaves of the tree quiver when they remember this fact. The Poplar's ability to resist and to shield, its association with speech, language and the Winds indicates an ability to endure and conquer. Rowan Tree -- The tree of vision, healing, psychic powers, Rowan is associated with witchcraft and is also known as the Wicken Tree and Witchbane. Twigs and branches of the rowan tree help to bestow protection and runes were carved with sticks from a rowan tree. It is also a tree held dear by the Celtic Goddess Brigid. Rowan is also used during rites of the Moon and for rites of knowledge and divination. This is based on the Celtic calendar of the 13 moons and represents the Moon of astral travel and vision, healing and empowerment. Willow Tree -- Since ancient times the willow tree has been associated with sorrow and death and it is also considered a tree of enchantment. Used in fashioning witch's wands used for divination. Yew Tree -- Found in ancient cemeteries, this tree is said to grow a root into each corpse in the graveyard and is a symbol of rebirth and may have been used as wood for the “fe" rod, used for measuring of graves and corpses and in the making of shields. It is good medicine for working with past life issues.